1. New Yorkers are the friendliest people in the world. Looking a bit lost? Someone will stop and help. Worried it’s been a while since a mean-looking gangster joked about kidnapping your son whilst giving him the biggest bear hug you’ve ever seen? Look no further. Friendly locals trying to kidnap Finn. For a boy who doesn’t cuddle many people he took a real shine to these guys. We saw them the next day and there were MORE HUGS and fist bumps. 2. New York is the second biggest city in the world. 4. The Statue of Liberty has tighter security than at the airport with 2 separate security searches and x-ray machines at each side of the river. NO BAGS allowed. 5. The Subway is not intuitive. For such a massive beast of an underground transport system, you’d think you wouldn’t need to rely on knowing which direction is north and which is south. But you do and sometimes you end up going the wrong way because of it. Amazing jazz band we discovered whilst waiting to get out of Brooklyn after ending up there by accident. 7. There are hardly any public toilets- even budget restaurants don't provide them. This made needing a wee quite difficult- thank goodness for Burger King. 8. The cool independent toy shops in ‘Big’ and ‘Home Alone 2’ have shut down thanks to Toys R Us moving opposite Macy’s. Korea Town. My favourite, Bi Bim Bap- a dish served in a smoking hot bowl. The rice at the bottom ends up going crispy despite being coated in delicious, spicy unctuousness. AND you get a fried egg on top. 9. Macy's is the biggest shop in the world. 10. Korea Town is the new Chinatown, which is great because Korean food is fragrant, healthy and a delightful journey of textures. 11. A Cinnabon is the Devil work. It is cinnamon pastry with cream cheese frosting and if you eat one you may eat nothing else for the rest of your life and die from cholesterol. 12. Times Square has so many neon lights and adverts that it feels like you have entered a hyper real state which is even brighter than daylight. Outside Joes pizza which is covered with photos of all the celebrities that eat there. Peter Parker even WORKED here. Great pizza too. 13. Food is bloody expensive, but Joes pizza is only $3 a slice and it is delicious. 14. The buildings are so tall they make you feel dizzy and they are of varying styles. Art Deco, Baroque and futuristic skyscrapers sit side by side. It’s a beautiful patchwork. 15. When you drive out of Brooklyn, there is a legendary sign that says ‘Fuhgeddaboudit’ people here actually DO speak with a New York drawl. IT’S REAL. 16. You are not allowed into the Plaza hotel unless you have a reservation. Not even to look at it because of Home Alone 2, not even just for a minute. 17. loads of people have dogs and there are designated ‘dog parks’ which are completely enclosed and doggy people can hang out with their pooches. 18. Space is at a premium. Next door to our apartment were 5 adults living in a 13’ x 8’ space. Due to the space issue, some schools actually shut the street so the children can play outdoors. 19. Some people that work in the hotels in Manhattan travel for two hours to get to work because living here is so expensive. Unless you started renting 20 years ago and your rent has been frozen, THEN you can live here and be very pleased about it, too. Jordan thrashed us at chess. 21. 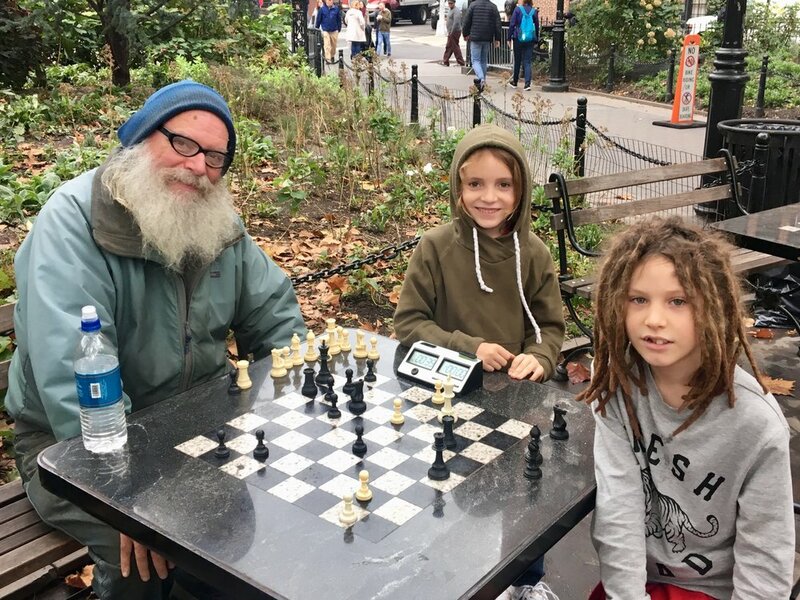 If you meet an old dude who looks like Santa with a chess board in Washington Square Park, stop and say ‘hi’. People queue up to play him because he’s so good. We lost but loved it anyway. 22. In the 1800s and over the course of 62 years, 12 million immigrants entered New York, welcomed by the Statue of Liberty who promised to break the shackles of the oppressed. New York is vehemently proud of its rich collective heritage. 23. Everyone we met here hates Trump.